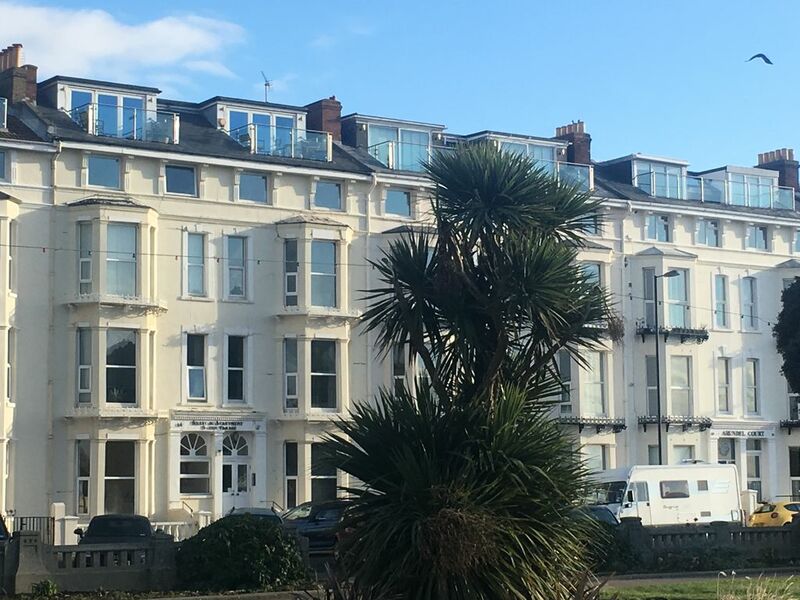 Seafront apartment with lovely bay window, in a great location, between the South Parade Pier and Southsea shops & restaurants. The D Day Museum, Pyramids Leisure Centre, Canoe Lake, Henry VIII Southsea Castle and a large green common all an easy walk. Other amenities easily accessible by bus/car. Many sporting activities available, kite surfing, wind surfing, sailing, Championship football club (Pompey). Lovely property, which makes the most of its amazing views. The location was perfect for us. There was so much to do within about 10 minutes walk. For a car-free trip with children it worked absolutely brilliantly. I hope we’ll be back soon. Lovely light and airy apartment. Great location with the bonus of a private parking space. This apartment is perfect for enjoying Southsea seafront. It was very clean and the furnishings practical and comfortable. The layout is spacious with a stylish decent to the master bedroom. The smaller bedroom is well laid out and my granddaughters loved it and slept soundly! The shower is excellent. Fabulous view from living room through lovely big windows. We stayed here to attend our daughters wedding at Southsea Castle and it was great to be able to walk back afterwards and collapse into comfortable beds! The owners were helpful and friendly when I had to contact them with questions prior to our stay. A welcome pack of beer, wine and crumpets was a nice touch. I would recommend this apartment and would definitely stay again. Thank you for your review. We are so pleased that you had a co firtabkd stay and enjoyed the apartment and it’s licatuon. We are pleased that the wedding went well! Very clean, spacious apartment with a sea view. The location was perfect for me as it was walkable to the boardwalk, parks, pier, entertainment along with a parking space. Jane was very accommodating and friendly and made sure my stay was comfortable. It surpassed my expectations and loved the location and would highly recommend Seaview Apartments. Thanks Jane! We enjoyed our stay in this comfortable apartment, with a great view across garden to the sea. It was conveniently situated, being within walking distance of shops, pubs and the beach and attractions of Southsea, and it was easy to visit the Historic Dockyard, which we did twice, due to poor weather. The main room is a great size and well furnished. The double bed was very comfortable, and the apartment was clean. We appreciated the pint of milk and bottle of wine, along with the tea, coffee, cereal and brioche there when we arrived. Our two teenagers struggled a little with the size of the second bedroom with both beds up, but one of them is 6'3"!. If we return he would probably use the sofa bed instead. The kitchen doesn't have a huge range of cooking utensils. There wasn't a saucepan large enough to cook pasta or potatoes for 4 of us, for example. As we only stayed for the weekend we ate out, but if we wanted to stay longer and cook some meals we would take our own saucepans/casserole dishes etc with us! Overall a very nice stay. Good apartment on the seafront. Property was well laid out and nicely furnished, with some nice touches such as some food and wine provided. Large windows in main living room look across park with glimpse of the sea. Lovely apartment - great for families. Great location. Some nice personal touches. Jane met us with keys and made sure we knew where everything was / how it all worked before leaving us to enjoy our stay. Some lovely little touches like milk, crumpets and a bottle of wine provided. Lovely decorated apartment, a little quirky with main bedroom downstairs from rest of rooms. Nice bathroom with large walk in shower. Decent sized towels provided. Lovely location over looking the sea front on South parade. Parking provided so we left the car and walked into Portsmouth along the sea front (there are quicker routes) but we stopped at play area on the way (for our 2 year old) and had a coffee in the sunshine. About 30 minute walk pushing a pushchair. We would highly recommend the Historic Dockyard. The Mary Rose and HMS Victory were highlights as well as one hour harbour cruise. We had a wonderful time in Portsmouth.